California’s drought is four years old, but in December 2014, downpours and atmospheric rivers made a major impact on the state’s water situation. 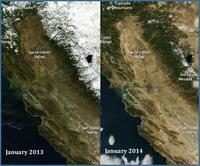 Satellite photos from the National Oceanic and Atmospheric Administration show the state was noticeably greener in January 2015 as compared to satellite photos from February 2014. It’s important that consumers understand the big difference a little rain can make. By installing a rainwater harvesting system to a structure – residential or commercial – a consumer can collect thousands of gallons of water and help conserve the existing water available for public use. Despite the California rains, the serious water shortage continues, and officials say it would take 150% of the state’s annual rainfall to recover from the long dry spell. Last year, scientists estimated that the state lost 63 trillion gallons of water during the previous 18 months.